Essentra Specialty Tapes, a leading adhesive tape supplier, introduces six of their trusted core adhesive tape products available now in Finger Lift format: DK Film®, DK Film® Acrylic, DK Film® Hi-tack Acrylic, Duraco® Red, Duraco® Gold and Dubl Kote®. Additional to Essentra’s core products, they are releasing three new families of box closure tapes specifically designed for overnight mailers, corrugated mailers and other applications such as transit packaging. The Finger Lift format is a dry edge liner distributed evenly on both sides beyond the width of the adhesive strip. The extended liner allows for quick and easy removal which allows for less frustration with end users. Essentra Finger Lift tapes are double-sided tapes that offer customers ease-of-use in terms of time and labor efficiency compared to edge to edge liners. The Finger Lift format is a dry edge liner distributed evenly on both sides beyond the width of the adhesive strip. The extended liner allows for quick and easy removal which allows for less frustration with end users. Most Essentra Finger Lift tapes can be custom converted to various sizes for any project need and are suitable for industries such as Point of Purchase, printing, packaging, converting and paper splicing. Duraco® Red - double-sided film tape with a see-through red liner that facilitates precise positioning of the tape to the bonded surface. Its acrylic adhesive is clear, has excellent plasticizer resistance and tolerates high temperature applications. Duraco Red is an ideal tape for hard-to-stick applications, especially UV coated material. Dubl Kote® - double-sided foam tape with a permanent rubber based adhesive, available in long rolls for automatic or hand application. Dubl Kote is ideal for filling spaces and conformable for bonding to many different types of surfaces. DK Film® - a double-sided tape with a polyester (PET) film carrier and a permanent rubber based adhesive. Rubber based adhesives quickly adhere to a variety of surfaces such as extrusions, packaging, signage and POP displays. DK Film® Acrylic - PET film carrier with a permanent acrylic based adhesive on both sides. The acrylic adhesive is ideal for demanding indoor and moderate outdoor applications. DK Film® Hi-Tack Acrylic - permanent hi-tack acrylic based adhesive, double coated on polyester film. This film tape is designed to perform in the most demanding applications. Duraco® Gold - white PVC film carrier, double coated with a permanent acrylic based adhesive that provides excellent adhesion properties. The extra thickness of this film product makes it well suited for textured or irregular surfaces. Box Closure – new double-sided film tape product line with a permanent rubber-based adhesive. These products increase bond strength to paper stock and corrugate substrates such as mailers and chipboard packaging. Available in 3 ranges, 4991 for general purpose, 4999 general purpose with thicker liner for high speed application and 4001 for high performance. For more information on Essentra Finger Lift tapes and to request a free catalog, visit: http://www.essentraspecialtytapes.com/Finger-Lift-Tapes. Free product samples are available to editors upon request for evaluation and review purposes. About Essentra Specialty Tapes, Inc.
Essentra Specialty Tapes offers a wide selection of uniquely functional tapes required by a wide range of end-markets, such as: Point of Purchase displays, to effectively merchandise store products in retail establishments; by appliances, to make them water-tight and quiet; in buildings, to reinforce structural or design elements; in schools and museums, to provide permanent and temporary fastening solutions for changing needs; for sealing envelopes and securing package contents prior to shipping; and for many more customer requirements. 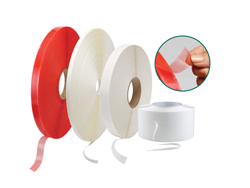 Products include foam tapes, transfer tapes, hook and loop fasteners, film and laminating tapes, high bond tapes, weather stripping, bumpers and magnetic tapes, among others. All products are available in stock, with the company also able to accommodate custom orders. The company has almost 70 years of design and manufacturing expertise that ensures dependable product performance and unmatched service. The company’s express distribution locations are positioned to provide customers fast, local and convenience service. Essentra plc is a FTSE 250 company and a leading global provider of high volume, essential components and solutions, which serve customers in a wide variety of end-markets and geographies. Headquartered in the United Kingdom, Essentra’s global network extends to 33 countries and includes 9,000 employees, 69 principal manufacturing facilities, 64 sales and distribution operations and 5 Research and Development Centers. For further information, please visit http://www.essentra.com. 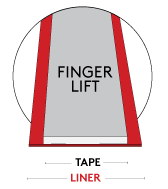 Illustration of Finger Lift Tape Liners.The extended liner allows for quick and easy removal.